Home/Day Trips/Kalathenes, the traditional Cretan village with a Venetian touch! Kalathenes is a village 12km from Kissamos that remains intact from the time. It is located in the mountains at a altitude of 290m with great views to the mountains and to the sea from some parts of it. It is a historical village with some historic buildings from the Venetian times that worth a visit. A visit to Kalathenes can always be combined with a walk to the Sirikari Gorge (click here for additional info). There are four main neighborhoods that consist the village and the population is about 200 residents. 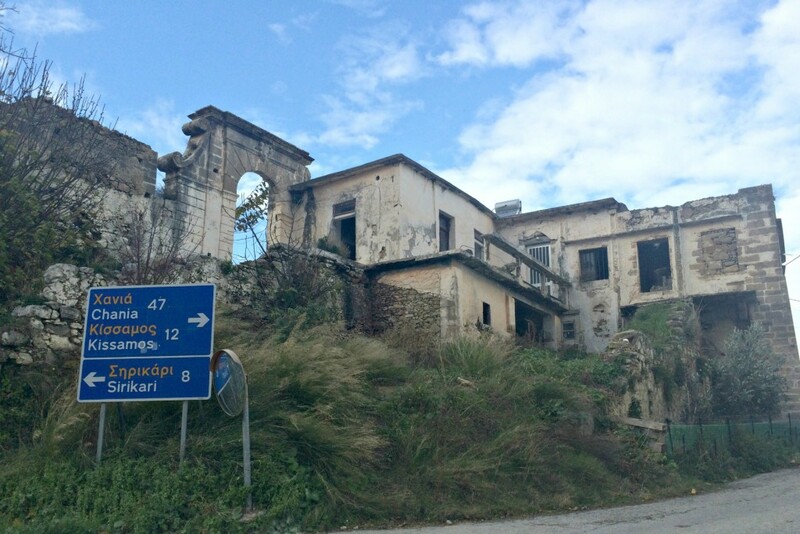 The village is full of green, old stone houses, Venetian ruins and many routes for walking around. You can begin your day there by having your coffee at the traditional coffee shop named Rotonda in the square of the lower part of the village. It is located in the point “1” in the map. You can either enjoy your coffee overlooking the great views to the mountains and to the sea or under the residence of an Venetian Governor of the area dated back to 1630. As you can see in the photo the entrance is still like when it was built. Climb the stairs and enter the inside area of the complex were you will see the main building from inside. Nowadays it is used for residence from various families of the village while there are some ruins as well. While being in this neighborhood you can visit a picturesque pavement where old and new houses are there to explore. Old olive oil factories, renovated houses since Venetian times and other smaller houses are there to explore. 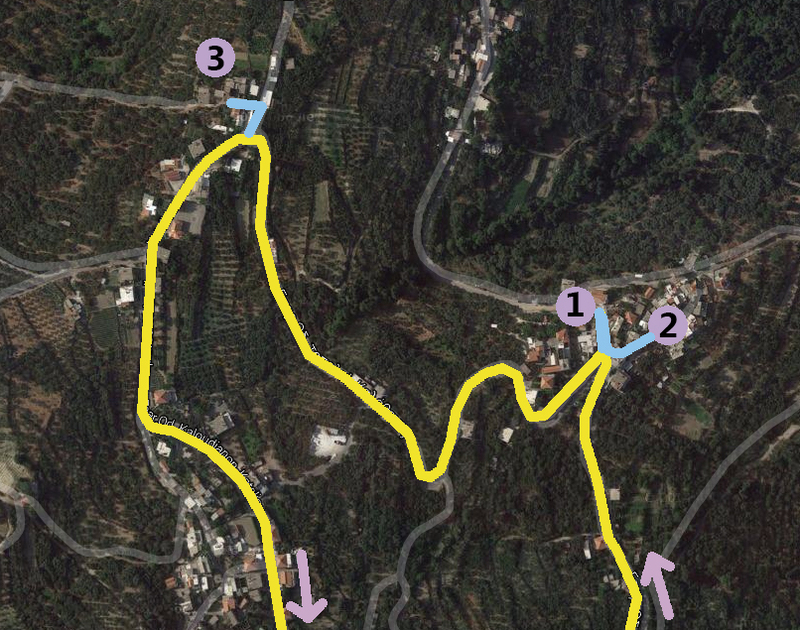 Visit the area with the number “2” in the map to see the traditional architecture of Cretan villages in Kalathenes. Do not hesitate to explore, but be careful at all times. After visiting the lower part of the village you can go to the upper part and to the neighborhood named “Rotonda”. In this area (marked as “3” in the map) you can find Villa Rotonda. This is the hot spot of Kalathenes. It is named rotonda due to the circular form of its plan. It was about to be the holiday residence of the Doge (King) of Venice. Venetians did not make it to finalize it due to the invasion of Turks on the 15th of June 1645. At the moment it is transformed to residence of locals but many parts of it remain intact and accessible by the public. The plans for Villa Rotonda were made by the architect named Onorio Belli. Onorio Belli was not only an architect but also a doctor and an archaeologist. The original maker of the plan was Andrea Palladio who made the Villa Capra “La Rotonda” in Vicenza (Italy). The same plans were also used for the White House in the USA from the architect of the President of the USA, Thomas Jefferson.